Save up to 50% on men's and women's activewear, with gym bottoms, tops, crops footwear and accessories from top brands such as Under Armour and Adidas included. Where do I use my The Sports Edit voucher code? 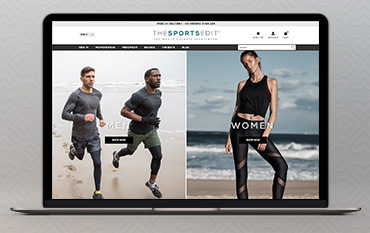 Keep up to speed with all the latest news, sales and offers by signing up to The Sports Edit. At The Sports Edit, they believe that exercise is the key to a balanced and healthier lifestyle and their aim is to inspire you to get out there, get sweaty and to start feeling good. Having launched only in 2015, The Sports Edit has certainly earned its credentials amongst its fellow competitors and now delivers to over 200 countries across the globe. With a presence both online and in stores, the expert team behind The Sports Edit scour the globe to hunt for brands and products which combine style, performance and enduring quality then offer you a unique edit of their very best picks. Uncover a diverse range of products where you can find everything including women's capri pants and sports leggings, yoga mats, running shoes, men's running tights, sweatshirts, tank tops and so much more! Whatever your fitness goal, The SPorts Edit have one mission in mind which is to empower you to achieve those goals in serious style. Browse the expansive collection for both men and women online and add one of our fantastic money-saving Offers onto your order at the checkout to see the price drop before your eyes. A healthier lifestyle starts with what you wear so why not get kick-started and make a great saving whilst you’re at it. At The Sports Edit, they are all too aware of how much plastic is corrupting our oceans which is why they are proud contributors of Eco-Friendly activewear. With mankind pouring a truckload of plastic into our water, The Sports Edit are passionationate about doing their bit to combat this rising issue which is why the feature brands like S’Well, Adidas, Teeki and Manduka which are embracing eco-innovation. These popular brands have created their very own eco friendly collections including water bottles, leggings spun from fibers of recycled plastic water bottles and Ultra boost trainers. Be part of the movement. Incorporating sports and activities into your lifestyle is essential to leading a healthier and better lifestyle. What better way to kickstart your fitness journey or enhance your existing routine with some new and trendy sportswear? Head over to The Sports Edit online store today equipped with one of our Voucher Codes you can find featured right here on our deals page and make a great saving when you next buy online. Find your fitness motivation if great activewear and an even better money-saving deal. If you’re keen a lover of Yoga or Pilate fitness, The Sports Edit have all you need to kit yourself out with the most innovative and on-trend gear, you can find online. Browse the elite collection of premium yoga outfits and pilates clothes and all the accessories you need for a good workout. Browse capri pants, sports bras, tank tops and much more all sporting popular brands including Alo Yoga, Reebok, Sundry, Varley and so much more! Adding one of our Discount Codes onto your order at the checkout can ensure you don’t pay as much as you think online either, simply paste your code at the checkout and see the price drop before your eyes. Whether it’s cardio, weight lifting or yoga, the Men’s Training collection at The Sports Edit features clothes for every exercise habit you may have. Whilst their range is selected for performance, it doesn’t compromise on style so you can enjoy the latest trends at the best possible prices. Find men’s gym gear from tees and shorts to training hoes and hoodies for finishing off your stylish, sporty look. Enjoy all you need for a workout and so much more with The Sports Edit. If you are not happy with your purchase, The Sports Edit team promise to give you a refund and to make the process as easy as possible for you. You will need to make sure your item is returned within 28 days from point of purchase. As one of the UK’s leading destinations for active-wear which boats innovative designs and unique approaches to sports apparel, you can guarantee style & quality at The Sports Edit. The fashion-forward collection has been carefully curated to offer trendy sportswear from across the globe where you can find over 40 popular sports brands featured on the site. Shop online today using one of our NetVoucherCodes, The Sports Edit Discount Codes and save money off your next pair of running trainers or sports leggings - whatever you’re looking for, a handy saving is always a bonus. Specialising in running, training, yoga and pilates and featuring some of your favourite brands including the likes of Under Armour and Adidas, kit your workout out wardrobe today for less.